The bowl was shaped and polished on the wheel to emphasise the veins in the pinkish agate. Standing cup and cover; chalcedony; silver-gilt mounts; flattened globular body, lower part gadrooned; upright lip; knop with spiral flutes; octagonal base; conical cover, gadrooned on upper part; mount in form of coronet of trefoils; Gothic finial on top; mounts with tree-trunk entwined with vine leaves; cup rests on mount of oak leaves; colour is mainly grey, passing into lilac or a milky tint, with veins of red and white. Origin: Uncertain; no silver punch-marks; previously described as 'German, about 1480' but entirely remounted (with modern additions of agate) during 19th century. Marks: None has been found, nor is there any assay mark to indicate that the silver was scraped for testing. Commentary: In Read 1902, and again in Dalton 1927, the attribution of this covered cup to a German workshop, c. 1480, was made without reservation. Nevertheless, the present author's grave concern about the true age of the silver-gilt mounts and certain technical aspects of the construction led to the object's being described only as “in the late Gothic style” and as “exemplifying the court taste in the late Gothic period for collecting beautiful hardstones, shaped and polished on the wheel” (Tait 1981, p. 32, pl. IV, where care was taken not to repeat the former published attribution to a late fifteenth-century German workshop). More recently it was possible to remove - in laboratory conditions - the bowl and calyx from the stem, thereby revealing even more compelling evidence of the nineteenth-century origin of the mounts and of the alterations to the agate bowl. (i) Grünes Gewölbe, Dresden: A small, straight-sided standing-cup and cover of reddish jasper with spiral fluting on bowl and cover; H. 22.5 cm (inv. no. V. 488, see J.L. Sponsel, ‘Das Grüne Gewölbe zu Dresden’, vol. I, Leipzig, 1925, pl. 4; Joachim Menzhausen, ‘Das Grünes Gewölbe’, Leipzig, 1968, p. 73, pl. 9, where the mounts are again described as 'copper' and the cresting on the cover as 'gilded bronze'; also Hans R. Hahnloser and Susanne Bruger-Koch, ‘Corpus der Hartsteinschliffe des 12-15 Jahrhunderts’, Berlin, 1985, p. 190, no. 370, col. pl. XXI, pl. 314, where the mounts are described as silver-gilt). The main differences between this fifteenth-century example, which is unique in possessing its original hardstone cover, and the Waddesdon Bequest version are, firstly, the greater simplicity of the Dresden covered cup: the octagonal foot has a very simple flat mount with a border of bold square-ended 'claws'. Secondly, the eight-sided foot rises to form a slender eight-faceted stem - without any spiral or twisting. The mount at the join with the base of the bowl is an elegant form of 'inverted cresting' which does not repeat the design of the cresting protecting the rim of the cover. Furthermore, the cover is neither conical nor enriched with any other metal mounts (except for a later repair to the jasper finial). Whereas the rim-mount on the bowl is plain and functional, the cresting around the rim of the cover is both open and delicate; the latter is accompanied by a rounded fine-wire 'chain' - the only feature that can be said to be at all similar to the Waddesdon Bequest example. (ii) Grünes Gewölbe, Dresden: Two jasper spherical bowls, both fragments of standing-cups (now lost); the larger has a vertical cylindrical neck and a short downward-projecting section beneath the bowl (H. 12 cm; inv. no. V. 558); the smaller has no neck but is ground flat on the top edge, thereby cutting off the spiral fluting, and underneath it has a short downward-projecting section (H. 6 cm; inv. no. V. 559; see Hahnloser 1985, p. 196, nos 387-8, pl. 327). These two unmounted fragments of standing-cups provide valuable evidence of the method of cutting the bowl so that the uppermost section of the stem was incorporated on the underside of the bowl. This short cylindrical section would not be polished because it would be hidden beneath the upper collar (gold, silver or gilt-metal) of the stem. Furthermore, the larger of the two bowls corresponds very closely in its form of spiral fluting - also stopping at the shoulders. However, the cylindrical neck does not need a metal mount to hide (and, indeed, secure) the join between the base of the neck and the mouth of the spherical bowl - there is no join. If the smaller of the two bowls was to have had a vertical cylindrical neck, like the Waddesdon Bequest example, then it too would have needed a metal mount at the join, but, significantly, the spiral fluting does not stop at the shoulders and so the intention may have been different - perhaps it may have been designed as a large knop for a stem. In the absence of any well-documented standing-cup incorporating a hardstone spherical bowl and a hardstone vertical neck, with which to compare the Waddesdon Bequest example, it is impossible to reach any firm conclusion about late fifteenth- or early sixteenth-century practice. On the evidence of the two unmounted bowls in Dresden, however, there is far more evidence in favour of the vertical neck being carved in one with the bowl (as on the larger of the two) and of stopping the spiral fluting at the shoulders. Although the evidence of the smaller of the two bowls remains ambiguous, it seems unlikely that the flat surface around the rim was intended to receive a separately made vertical neck, because no moulding or lip was cut to give the 'claws' of the metal mounts a suitable surface around which to grip and so secure the neck to the bowl. (iii) Stockholm, Swedish Royal Husgerådskammarens: The Jupiter agate standing-cup with spiral fluted spherical bowl and enamelled gold mounts and cover surmounted by Jupiter and his Eagle (H. 26.9 cm; inv. no. HGK. SS. 28; also Nationalmusee utställningskatalog 305, p. 497; see ‘En Värld i miniatyr’, Stockholm, 1982, p. 88, no. 28, col. pl. on p. 87). Although the bowl is very similar to the Waddesdon Bequest example, both in its form and in its spiral fluting (stopping at the shoulders), it has no hardstone neck - only a short one in gold. This gold neck and rim-mount, like the entire cover of gold, the two gold collars above and below the knop of the stem and the gold foot-rim, are enriched with high-quality enamelled decoration typical of the second quarter of the seventeenth century. The octagonal agate foot, rising to form the bottom of the stem, has eight straight facets - similar to those already noted on the Dresden jasper covered standing-cup. However, the stem is quickly interrupted by two large seventeenth-century enamelled gold collars, which have been introduced above and below the simple faceted agate knop. Consequently it may be assumed that this Royal Swedish Kunstkammer piece was mounted by a Court goldsmith, who had been commissioned to incorporate as much of the late medieval agate cup as had survived. Was a nineteenth-century goldsmith similarly commissioned to do the same when the standing-cup and cover (now in the Waddesdon Bequest) was created in its present form? (iv) Copenhagen, formerly in the Danish Royal Kunstkammer and, since 1824, in the National Museum: An agate double standing-cup formed by fitting together two almost identical bowls, each with spiral fluting (H. 15.8 cm; inv. no. D. 99; Hahnloser 1985, p. 200, no. 399, pl. 336). These two late medieval bowls, together with a hexagonal foot rising to a very short six-faceted stem, have been set in elaborate mid-seventeenth-century enamelled gold mounts, richly decorated with floral motifs. This piece is evidence, yet again, of these incomplete pieces of late fifteenth-century carved agate vessels being salvaged and reassembled within extravagant gold enamelled mounts for a seventeenth-century Kunstkammer. (v) Copenhagen, Rosenborg Castle: A jasper, footed bowl, with spiral fluting on the hemispherical bowl (H. 6.1 cm; inv. no. L. 95; see ‘Christian IV and Europe’, The 19th Art Exhibition of the Council of Europe, Copenhagen, 1988, p. 180, no. 644, with illus., where the mounts are described as “gold with niello”; also Hahnloser 1985, p. 214, no. 442, pl. 362, where the mounts are described as “silber vergoldet, email”). Fortunately, this historic piece of fifteenth-century carved red jasper is known to have been mounted in Denmark in 1627 for Kirsten Munk (1598-1658), who was married in 1615 to King Christian IV of Denmark and bore him twelve children. Its subsequent history is also well documented, and it is yet further evidence of the fashion for remounting these pieces of late medieval hardstone carving, possibly because the original mounts had been made only of gilt copper - as, for example, on the very comparable late medieval agate footed bowl (H. 8 cm), which has been preserved in the Kunstkammer of the Dukes of Württemberg (Stuttgart, Württembergisches Landesmuseum, inv. no. KK. 98; see M. Landenberger, ‘Kleinodien aus dem Württembergischen Landesmuseum, Stuttgart’, Pfullingen, 1973, p. 18, col. pl. ; also Hahnloser 1985, p. 214; no. 443, pl. 363). (vi) Grünes Gewölbe, Dresden: A standing covered cup, evidently created from several components of mixed origins, includes a hexagonal agate foot with slightly twisted or spiral facets rising to a six-sided stem, a rock-crystal bowl, silver-gilt mounts and silver cover with finial figure (H. 20.5 cm, inv. no. V. 223; see Hahnloser 1985, p. 220, no. 459, pl. 373). The cutting of the agate foot and stem, with its slightly spiral facets, is very similar to the carving on the foot of the Waddesdon Bequest standing-cup and cover, although neither the shape nor the profile is the same, and, in Hahnloser 1985, the carving of the agate foot and stem of this Dresden conflation was stated to date from the fifteenth century. Although other documented examples of this type of late medieval hardstone carving survive, their relevance is less direct - see, for example, the two pairs of footed bowls in Vienna (‘Katalog der Sammlung für Plastik und Kunstgewerbe’, Kunsthistorisches Museum, I, Vienna, 1964, nos 40-1; II, Vienna, 1968, nos 38-9, or those in Florence and Modena (Hahnloser 1985, nos 396-7, 438, 440-1, 446, pls 334-5, 360, 362-3). No well-documented example has survived in which the stem incorporates a knop of spherical form - let alone with spiral fluting, as on the Waddesdon Bequest standing-cup and cover. Indeed, the only well-documented example with a carved knop in the stem is the Stockholm Jupiter standing-cup, which, although remounted in the seventeenth century, appears to have retained its rather modest, faceted, late medieval knop. In its simplicity and small scale it bears no relation to the colourful and almost massive knop on the Waddesdon Bequest standing-cup, which can best be compared with the one fully documented spherical piece of banded agate that has survived: it is the musk-ball or pomander - Bisamapel in German - from the Kunstkammer of the Dukes of Württemberg (Stuttgart, Württembergisches Landesmuseum, inv. no. KK. 120; DIAM. 4.1 cm; H. Siefert, in ‘Die Renaissance im Deutschen Südwesten, exh. cat., Karlsruhe, 1986, p. 687, no. L 126, with illus., where it is tentatively described as “Deutschland (? ), 1520 (? )” and discussed in relation to the evidence of the portrait of Susanna von Pfalz in the Bayerische Staatgemälde-sammlungen, Munich, no. 2450). Although the similarities are striking, there is neither spiral fluting nor is the vertical fluting as sharp as on the Waddesdon Bequest knop. Indeed, the latter is so deeply and crisply cut that the spiral flutes effectively prevent the serrated borders of 'claws' (above and below the knop) from resting on the surface of the agate - let alone gripping the knop to ensure that it is held secure within the silver-gilt mounts. (i) The foot and stem being drilled to take a modern central rod, which is attached to the stub on the underside of the bowl in a way that disregards the former means (grooves, etc.) of fastening. (ii) The foot and stem being made incapable of unscrewing and disassembling in the normal manner by the introduction of a modern cylindrical silver tube. (iii) The octagonal agate foot being cut in an almost straight oblique profile, instead of the normal concave curve leading up towards the vertical stem section. (iv) The sharpness of the cutting of the spiral fluting of the knop and because it is fitted like a 'sleeve' over the hollow cylindrical silver stem, there is a total disregard of the true function of the 'claws' of the mounts above and below. (v) The failure of the bowl to rest snugly in the modern silver-gilt calyx of leaves - the reverse of which vividly proclaims that it is a modern electrotype (galvano-plastique) - creates a curious gap between the two surfaces, although there is neither looseness nor movement. (vi) The application of a separately made neck on to the top of the bowl - apparently using some form of adhesive and not relying on the silver-gilt collar to secure them together. (vii) The conical cover, which has a shape that is without parallel, and the two mounts (a fine-wire 'chain' and a coronet of trefoils) applied to two rounded mouldings, one above the other, in the most unexpected fashion, while leaving the rim totally unprotected. (viii) The perfect condition of all the silver-gilt mounts, from the very vulnerably placed finial and coronet (on the cover) to the foot-rim; in addition, their repetitive character and lack of finesse in detail create an impression of coarseness that is indicative of the nineteenth century and completely at variance with the proposed origin of this luxury object at some leading centre of courtly patronage around 1500. As a result, only the agate bowl - without its neck - and the octagonal foot (with its cracks and signs of wear) can be accepted as probably having a late medieval origin, though even the foot and its (now lost) stem have been so severely trimmed that only the middle section has remained, thereby creating a less curving outline than is usual. (i) The covered standing-cup in the Museo Lazaro Galdiano, Madrid; (H. 21.5 cm; see Hahnloser 1985, p. 196, no. 386, pl. 327, where the authenticity of the late medieval carving is questioned.) Furthermore, the silver-gilt mounts, which have almost identical serrated 'claw' borders to those on the Waddesdon Bequest example, are also doubted in Hahnloser 1985, where the attribution “German, circa 1600” is questioned. The author's limited access to this object has reinforced his conviction that no part of this object was older than the nineteenth century. Neither its form nor its technical execution was acceptable as consistent with late medieval practice. (ii) The so-called 'Gothic covered salt-cellar of pink agate'; (H. 15.5 cm; Sotheby's, London, 13 December 1979, lot 90, col. pl. ; Sotheby Parke Bernet Monaco S.A., 26 May 1975, lot 154, col. pl. ; formerly in the Château de Ferrières, France, built in 1857.) The silver-gilt mounts of cast and pierced foliage are particularly heavy and obtrusive around the rim of the bowl and the rim of the cover - the latter being so similar to the bowl that they form a spherical double-cup when joined together. 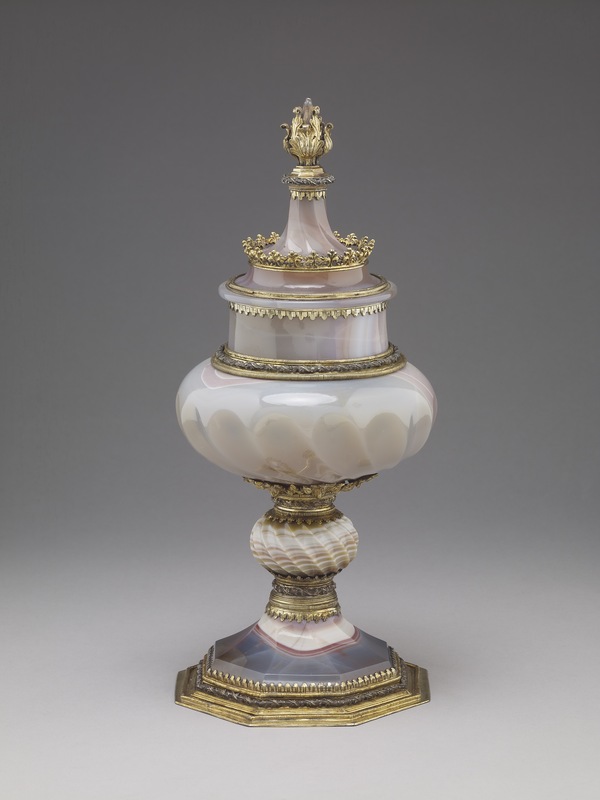 The hexagonal stem and foot are carved from one piece of agate but the six sides of the foot-rim are disguised by the elaborate silver-gilt rim-mount with its six segmental lobes, each filled with Gothic foliage - thereby creating a curious six-lobed base around the hexagonal agate foot. The faceted agate finial (on the cover) rests in a tiny openwork coronet and is capped by cagework foliage of feeble, meaningless design. Undoubtedly this object, like that in the Museo Lazaro Galdiano, has remained unaltered since it was made. (iii) The agate Scheuer or standing-cup with handle; (H. 21 cm; Victoria and Albert Museum, inv. no. 389-1854; C. Oman, ‘German and Swiss Domestic Silver of the Gothic Period’, Victoria and Albert Museum, 1960, pl. 21; H. Kohlhaussen, ‘Nürnberger Goldschmiedekunst des Mittelalters und der Dürerzeit 1240-1540’, Berlin, 1968, p. 161, no. 250, fig. 274; J. M. Fritz, ‘Goldschmiedekunst der Gothik in Mitteleuropa’, Munich 1982, no. 639; Hahnloser 1985, p. 195, no. 385, pl. 326). The tall stem of this unique specimen does not unscrew and the author has not had the opportunity of seeing the silver-gilt mounts removed, but from his detailed observation of the object he has noted, firstly, that the neck of agate is also made separately and is joined on to the bowl in exactly the same way as on the Waddesdon Bequest standing-cup. Secondly, the goldsmith seems to have deliberately tried to mislead the viewer, because the double strap-mount beneath the handle divides as if it had to open out in order to pass on either side of the handle. In fact, the handle does not appear to have been carved in one with the bowl, any more than the neck had been. The agate handle within the silver-gilt strap-mount appears to be carved separately and may not be attached to the side of the bowl; indeed, the spiral fluting on the bowl appears to continue without any change in the area of the handle. Thirdly, the spiral facets of the eight-sided stem and foot follow a gentle curve to the perimeter of the foot, which, unexpectedly, is circular. This surprising feature - so contrary to late medieval design and practice - is disguised by the goldsmith with an eight-lobed foot-rim, with pierced and cast foliate ornament, standing high above the solid silver plate beneath. In the centre (on the underside of the foot) there is a similar concave polished roundel, but it is the difference in the workmanship of the silver-gilt cresting when compared with that on the Waddesdon Bequest standing-cup and cover that makes the suggestion of a possible common origin for the mounts seem less likely. The Scheuer, which was purchased in 1854 by the South Kensington Museum without any previous history, was certainly made de novo and had not been subjected to any alterations before it entered the Museum in 1854. (iv) The jasper standing-cup and cover with silver-gilt mounts set with six sapphires and engraved with the coat of arms of the Visconti of Milan (H. 17.4cm; Kunstgewerbemuseum, Berlin, inv. no. 1969-10; see K. Pechstein, in ‘Europäisches Kunsthandwerk: Neuerwerbungen 1959-1969’, Katalog des Kunstgewerbemuseums, Berlin IV, 1970, no. 6, with illus., where it was attributed to Milan during the last quarter of the fifteenth century). The cover and the bowl, both carved with spiral gadroons and a horizontal groove (below the rim), are of almost identical shape and size, thereby creating a spherical entity when the gem-set rim-mounts are fitted together - just as in the case of the Château de Ferrières example mentioned above. However, on the Berlin piece the rim-mounts are less obtrusive, apart from the use of sapphires - and the six-sided stem and foot is shorter. Indeed, the circular foot-rim has an undulating silver-gilt mount that is strikingly similar to the gold and niello mount of 1627 that protects the similar footed bowl (without cover) that was mounted for Kirsten Munk, the wife of Christian IV of Denmark (Rosenborg, Copenhagen, inv. no. L. 95; already discussed). Consequently, the ubiquitous 'Gothic' cresting used on the finial and at the top of the stem, which may be derived from the famous jasper standing-cup and cover in the Grünes Gewölbe, Dresden, no longer seems so convincing, especially as it is accompanied by a band of dentil decoration (running round the rim-mount encircling the spherical body) - a unique feature within this particular group of 'late Gothic' hardstone mounted vessels. In this context, reference has to be made to a remarkable, but unprovenanced, pair of agate salts (H. 12 cm) which the author has not seen, let alone examined closely. This pair (with 'late Gothic' spiral fluted bowls and faceted stem-foot elements) are exceptional in having elaborate, but unmarked, silver-gilt mounts (foot, stem and rim) in the northern Renaissance style - recently described as “probably French, second quarter of 16th century” (see J. F. Hayward, ‘Virtuoso Goldsmiths and the Triumphs of Mannerism 1540-1620’, Sotheby Parke Bernet Publications, London, 1976, p. 360, pl. 249). Like the Berlin jasper cup and cover, this pair have circular foot-rims, despite the facet-cutting; again, this has led to an undulating edge that is not ideal for the 'claws' of the silver-gilt foot-rim mounts. The technical construction of these salts, which is not described, is highly relevant to the problems posed by this group. In conclusion, the survival of four (or more) examples in a perfect state of preservation, although none has a history that can be traced back before the middle of the nineteenth century, must give rise to doubts about their authenticity, just as the Waddesdon Bequest standing-cup and cover in its present condition must now be regarded as largely a product of a nineteenth-century workshop. The choice is to continue accepting all these pieces at face value or to reassess them in the light of present-day knowledge about the activities of fakers during the last century. Even though indisputable proof may be lacking, the doubts seem well founded and fully justified. Hugh Tait, 'Catalogue of the Waddesdon Bequest in the British Museum. II. The Curiosities', British Museum, London, 1991, no.14, figs. 181-187.